The month of February represents “Heart Month” and Dr. Jason Lemieux takes us through one of the biggest challenges related to fitness. How do you measure how “healthy” you are and how do you best measure your heart rate? Coming into 2017, there are a number of tools and technology you can use for $100 to measure your heart rate accurately. Measuring your heart rate will help define the type of exercises you should be doing, if you’re getting a good night’s sleep and even if you should take a break for a day! In the following video, Dr. Jason Lemieux discusses how measuring your heart rate properly can help define and develop your health goals. 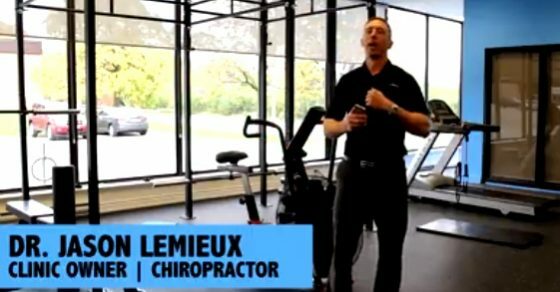 I'm Dr. Jason Lemieux, I'm a chiropractor and the owner of Physio in Oakville. Slightly outta breath. It's February and we're talking heart month. So anytime we talk about the heart, healthy heart, and we want to know that we have good cardiovascular fitness, one of the things that I find people have a difficult time in achieving some of their health goals is, we're not really measuring anything, right? When people wanna do very generalized goals, like I just wanna be healthier, that's great, that's noble, but what does that mean? And how do I know if I'm actually making progress that way, right? I wanna have something I can actually measure. And now it's 2016. There's tons of ways to get really good information from technology without having to spend a ton of money. So one of the ways to do that is to train with a heart rate monitor. We talked about this in other newsletters, but I workout pretty much all the time with the heart rate monitor on. I become kinda OCD with it. And one of the great things about working with a heart rate monitor, is it gives you real time heart rate information. Little wrist devices are great, but a lotta times that's more for kinda throughout the day. You know, the pedometer thing is great, having a...if it's a Fitbit or whatever, they're good for longer durations. They're getting better and eventually they probably might be just as good as a chest strap. But a chest strap heart rate monitor is kinda the gold standard right now, at least for something that you can have at home. It's gonna be under \$100, but provide you great information. So it works on kinda both ends of the spectrum. We see some people that are just getting back into fitness. We had a patient in the clinic whose doctor told him, "I do not want you exercising with your heart rate over 125." Well, I don't want to go to a gym and rely on the handheld heart rate system that's on most of those machines, because they're not calibrated very well, they can get interrupted by other people in the area that are wearing heart rate monitors. So again, less than 100 bucks. You can have a heart rate monitor on that's gonna be able to measure your heart rate in real time. So if your somebody who's been given a heart rate restriction or if you're an athlete that's just trying to do more recovery work, there are times where we'll tell people, "Hey, if you can do 20 minutes of exercise but keep your heart rate under 115, that does tremendous jobs for allowing you to sleep better at night, recover from your high intensity exercise." And then on the other end, when we have people that are more seasoned athletes, people that are in better shape that are looking to maybe take their fitness to the next level, that's when we can actually look at using the heart rate monitor, show whether or not your intensity matches your perception. And so you can see what your target heart rate is, your max heart rate is, and get better understanding of what kind of exercises tax you to that higher heart rate. And sometimes it might surprise you. An exercise that might feel real challenging, you may look down at your heart rate monitor and realize that, "Wow, you know what? My heart rate's nowhere near as high as I thought it was." And other exercises that maybe you didn't think were that taxing on your cardiovascular system might surprise you. So we can actually even monitor recovery during a bout. So one of the reasons I'm out of breath, is we just did a quick burst on the Airdyne that spiked my heart rate to 144. But within under a minute or so, I've been talking for a while here, but with under a minute or so, it was back down to under 100. So we wanna be able to see that the exercise I'm doing, I can also recover from. The other reason we love the heart rate monitor is I can wear it first thing in the morning for as little as, anywhere from like 60 seconds to 2 minutes. You can do this while you're brushing your teeth, while you're getting ready in the morning. And you can actually measure the quality of your sleep by looking at your heart rate variability first thing in the morning. So it can tell you on a scale of 10, you know, did you recover well from your activity yesterday? Whether it be exercise, whether it be a stressful day at work. And this can kinda guide you as to whether or not you should be...like, training hard that day, whether you should do recovery work that day, or maybe you need to take a day off entirely. Now we're being a little bit more objective rather than looking at the, "Hey you know, I felt okay today, or "I think this is working." You can even use a heart rate monitor to predict your VO2 max or estimate your VO2 max. So if you're gonna make that New Year's resolution, or now we're into February and we've been a little more consistent with our exercise, let's stop guessing. Let's be accountable to results. You can get a very inexpensive heart rate monitor, whether it's from Polar or other companies. And you can actually just laying down in bed, check you resting heart rate, and it will give you an approximation of your VO2 max, which is a great sign of cardiovascular health. Now as we continue on two weeks, four weeks, six weeks into your exercise program, you can retest that number and see, "Hey, have I been wasting my time or am I actually doing something that's getting me real results?" It's far to easy to measure this stuff now. So rather than just going rudderless and like I said, wasting your time, let's make sure that we're doing things safe and effective so I'm not overtaxing my system, but I'm also not leaving benefit and gains on the table, because maybe I can be pushing myself a little harder. I hate the, "Oh, I know my body." Well, your body might surprise you. Maybe you've got more left in your body than you think, and maybe sometimes you think you've got more in you than you do. Let's be a little more objective for this and you'll see that your results will come much faster.